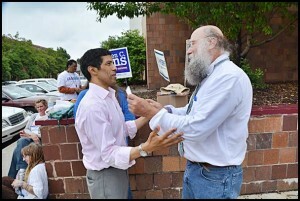 Democratic Congressional candidate Hansen Clarke (left) meets with a well-wisher during Tuesday’s Primary Election. Despite previously serving one term in Congress, Clarke came in third place, losing to Southfield Mayor Brenda Lawrence. Hamtramck voters were pretty much in lockstep with county and district voters. Like in many communities, voter turnout was extremely low, about 10 percent – a little over 1,000. Whether voters were aware of it or not, for most of the Democratic candidates who won Tuesday, they will easily be elected to office in the November election when they face their Republican challengers. That’s because most communities in Wayne County and the state and congressional districts that cover parts of Detroit tend to vote heavily for Democrats. In the biggest news of Tuesday’s election, voters here and countywide overwhelmingly rejected Wayne County Executive Robert Ficano’s re-election bid, opting instead to go with former Detroit Police Chief Warren Evans. In another closely watched race, voters here supported Hansen Clarke in the Democratic Congressional election, but unfortunately for him he did not do well outside of Hamtramck. Clarke finished a distant third to Southfield Mayor Brenda Lawrence. Clarke’s failure could likely be tied to the extremely low voter turnout in Detroit. State Sen. Bert Johnson got the nod here and district-wide for another term, although it was a close one with his former ally John Olumba. In a race closer to home, despite being a Hamtramck City Councilmember, voters here passed over Mohammed Hassan in his bid to unseat Rose Mary Robinson from her job as State Representative for the 4th District. Robinson won with 77 percent of the vote here and 85 percent of the vote district-wide. This was Hassan’s second defeat in his attempt to venture out of local elected office. As for the three tax millage proposals, Hamtramck voters differed from their counterparts in the county on only one issue – albeit an important one for the public schools. While Hamtramck voters approved a six-year tax millage that would have generated $1 million a year for the city’s public schools, county-wide voters rejected it by a slim margin. It was better news for the other proposals — to support the SMART bus system and eliminate the property tax on businesses — which both passed here and county-wide. Hamtramck School Superintendent Tom Niczay said he was not upset about the defeat of the county school tax. “We were not planning on this in our budget,” he said. One thing that may have softened the blow for Hamtramck schools is that the district won a tax millage in May worth several million dollars. That money will be spent on improving school buildings. The defeat of the county proposal will hurt the Detroit school district, which had counted on it to help reduce its deficit. During election day, Ficano and his main opponent Evans visited the Hamtramck Senior Apartments. Clarke took a break from his long day campaigning for lunch at Aladdin’s. He later stopped by the Hamtramck High School Community Center and city hall. Clarke was upbeat about the election, and said he was still ahead in the polls. That was true a few weeks ago when he had a comfortable lead over Lawrence, but by election day that lead had eroded. One thing that didn’t happen in this election cycle was a large number of voters voting by absentee ballot. During November’s election a surge of voters, over 1,700, opted to vote by absentee ballots. On Tuesday, that number was back to the normal level of over 300, which consisted mostly of seniors. It appears the city’s major voting bloc, the Bengali community, largely sat out this election. As of Thursday, the day The Review went to press, the defeat of Robert Ficano was still making news. In his 30 years in politics, Ficano had never lost an election. Despite that record and the power of the incumbency, Ficano never had anything close to a lead in polls leading up to the election, presumably because of the scandals and FBI investigations into his administration during the past four years. Call it strange timing, but there is a race of a different sort today (Friday, Aug. 8) at Hazel Park Raceway. In the first race, there is a horse named “Ficano” running. Anyone want to make a bet?